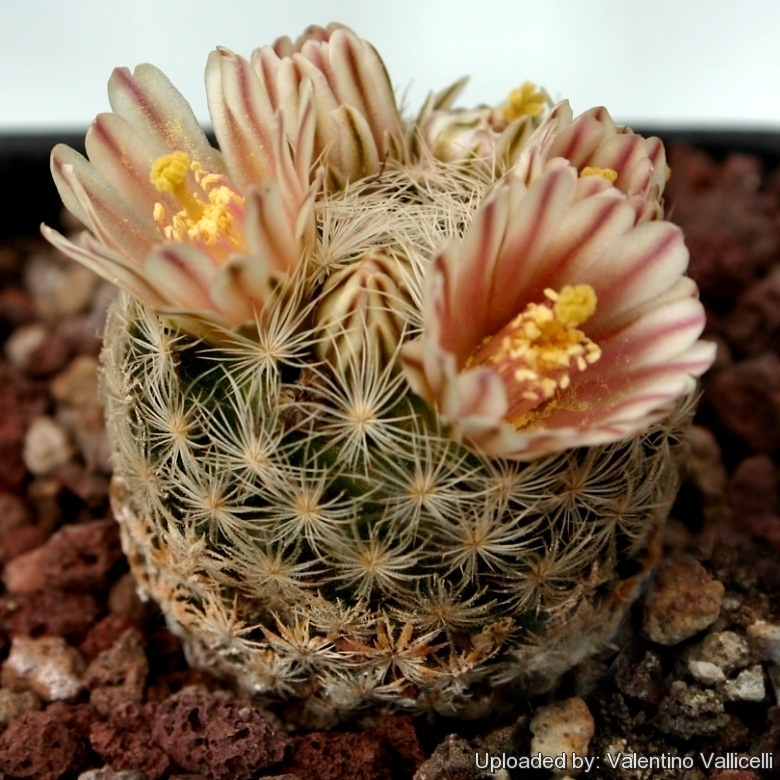 Accepted Scientific Name: Mammillaria lasiacantha Engelm. Fully grown, this species is only about 2 to 3 cm tall. It has small, almost friendly spines. The flowers are cream-white with brownish-red stripe in late winter or early spring. Origin and Habitat: USA (Texas, New Mexico), Mexico (Chihuahua, Coahuila, Durango, Nuevo León, San Luis Potosí, Sonora, Zacatecas). Habitat: Chihuahuan desert scrub with Agave lechuguilla, rocky hills, gravelly slopes, usually on limestone. 500-2100 m.
Mammillaria lasiacantha var. denudata Engelm. Cactus lasiacanthus var. denudatus (Engelm.) J.M.Coult. Mammillaria egregia Backeb. ex Rogoz. & Appenz. Mammillaria lasiacantha subs. egregia f. cristata hort. Chilita х magallanii (F.Schmoll ex R.T.Craig) Buxb. Ebnerella х magallanii (F.Schmoll ex R.T.Craig) Buxb. Mammillaria lasiacantha f. magallanii (F.Schmoll ex R.T.Craig) W.A.Fitz Maur. & B.Fitz Maur. Mammillaria magallani var. hamatispina Backeb. 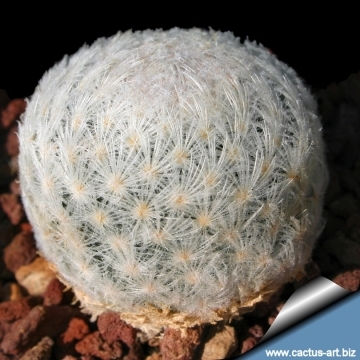 Description: Mammillaria lasiacantha a tiny usually unbranched or slowly clustering cactus, deep-seated in substrate and inconspicuous. Adults of M. lasiacantha usually have glabrous spines, but in some populations all plants may retain plumose spines at maturity. Stems: Depressed-spheric to short cylindric, 1-3.5cm wide × 1,5-7 cm tall. axils bare. Spines: 40-80 per areole, in several series but all equally thin, mostly appressed, white or very pale pink, often minutely tipped pinkish brown, innocuous, bristlelike, 0,5-6 mm, glabrous to plumose, all interpreted as radial, innermost spines shortest; No central spines. Flowers: 1-2,5 cm; white or cream, usually with sharply defined midstripes of green, yellow, tan, pink, pale purple, or reddish, blooming from January to March. Fruits: Scarlet, cylindric or clavate, 10-25 mm long with floral remnant persistent ripening in June August. Mammillaria lasiacantha Engelm. : Single or forming Small clusters of 2 or 3 heads. Stems are spherical usually less than 5 cm in diameter. They usually have soft glabrous spines, but in some populations all plants may retain plumose spines at maturity. Mammillaria lasiacantha var. denudata Engelm. : has always glabrous spines. 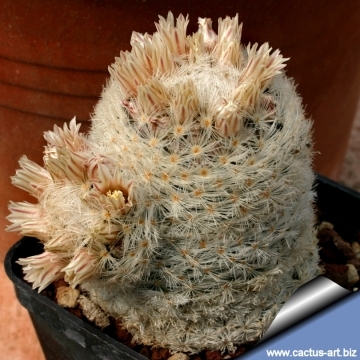 For all other characteristics it is comparable to the standard Mammillaria lasiacantha. Distribution: Big Bend National Park (Brewster County), Texas. 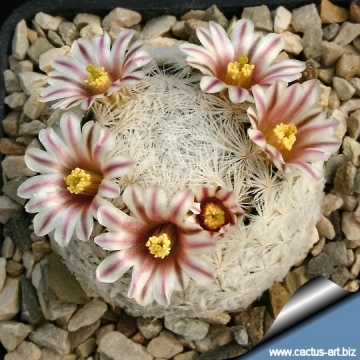 Mammillaria lasiacantha subs. egregia (Backeb. ex Rogoz. & Appenz.) D.R.Hunt: It forms small snow-white ball, usually unbranched, deep-seated in substrate and inconspicuous that become somewhat cylindrical with age up to 5 cm in diameter × 2-7 cm tall. 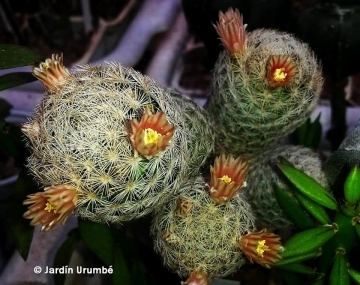 Mammillaria lasiacantha subs. egregia f. cristata hort. : crested form. It will slowly forms white tangled groups up to 10 cm in diameter. Mammillaria lasiacantha subs. magallanii (F.Schmoll ex R.T.Craig) D.R.Hunt: Small usually solitary slow growing species with short white spines. Stems globose to club shaped, green, up to 6 cm tall and 4.5 cm in diameter. Distribution: Coahuila and Durango. Mammillaria lasiacantha f. wohlschlageri (Repp.) Hoeve: Small plants with a flat fuzzy stem and creamy flowers blooming abundantly in late winter-to early spring. Radial spiness 26-36, glassy white, brown tipped, 2 - 6 mm long. 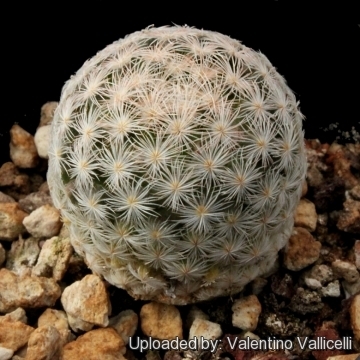 Mammillaria magallani var. hamatispina Backeb. : 50-70 creamy-yellowish radial spines with one hooked darker central spine. 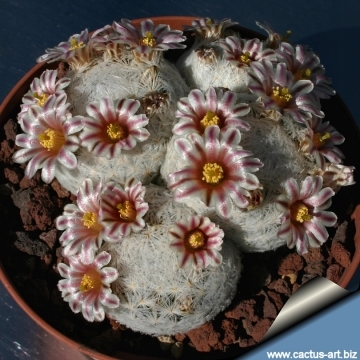 Mammillaria neobertrandiana Backeb. : Nice pink spines, the small winter flowers are pale pink with a pink/brown midstripe. Distribution: Lerdo, Durango. Mammillaria roemeri Wolfg.Krüger & W.Rischer: It is a neotonic (juvenile form which remains so) form of Mammillaria lasiacantha. The flower position and its later flowering distinguish it, as well as the spination. It looks different, but clearly related. Mammillaria sp. 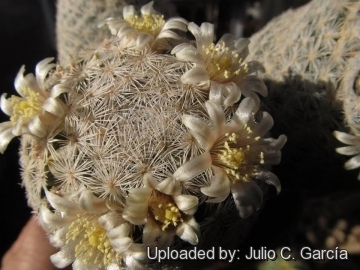 f. cristata SB500 Cuatrocienagas, Coahuila, Mexico: is a tiny crest form that may retain plumose spines at maturity.It slowly forms tangled groups up to 20 cm in diameter. Mammillaria sp. SB500 Cuatrocienagas, Coahuila, Mexico hort., S.Brack: (M. lasiacantha) Feathery form with tiny stems that resemble golf balls. Cultivation and Propagation: This plant has not the fame to be easy to cultivate, but in good conditions with very careful application of water and excellent ventilation, it grows without difficulty. Be careful to encourage slow growth, but if you succeed in growing a colony of stems, then the results will repay all the growing efforts. Growing rate: It is a slow growing species that will make clumps given the best conditions, but rewards the patient grower with a beautiful displays of flowers since from an early age. Soil: Requires excellent drainage provided by a very permeable open cactus soil (With not less than 50% grit content). Avoid the use of peat or other humus sources in the potting mixture. Repotting: Repot every 2-3 years. Use small sized pots. Feeding: During the beautiful season enrich the soil using a fertilizer rich in potassium and phosphorous, but poor in nitrogen, because this chemical element doesn’t help the development of succulent plants, making them too soft and full of water. Watering: Water should be carefully applied and only when the soil is dry to the touch, as this cliff-dwelling species is very prone to root rot. Allow soil to drain thoroughly before watering again. Additionally, water should not be applied from above, as the feathery spines will retain water and add to rotting problems, but in good conditions with excellent ventilation, in bright light, it usually grows without particular difficulty. Do not water in the winter. Light: Outside full sun or afternoon shade, inside it needs bright light, and some direct sun. Direct sun encourages flowering and heavy spine production. Hardiness: Protect from frost. But it's hardy to -5°C if kept dry. A winter rest that allows the plant to shrivel (perhaps losing up to 25% of its summer height) will encourage flowering and long time survival. - Mealy bugs: occasionally they develop aerial into the new growth among the wool with disfiguring results, but the worst types develop underground on the roots and are invisible except by their effects. Propagation: Direct sow after last frost or (rarely) cuttings. Seeds germinate in 7-14 days at 21-27° C in spring, remove gradually the glass cover as soon the plants will be well rooted (ca 1-2 weeks) and keep ventilated, no full sun for young plants!